Unlike the ride-hailing services, Uber & “regular” Lyft, the Minnie Van drivers are trained Disney Cast Members. This is great for a lot of reasons, but the biggest for me is trust and peace of mind. Don’t get me wrong, I’ve used the other ride-hailing services at Walt Disney World with no issues, but to me this feels like an extra level of security. You know the driver has been trained and tested for safety standards, and the vehicles are inspected regularly. And the cars themselves are SO clean. You also get someone who is knowledgeable about the roads on property and can get you where you are going without getting lost. Not to mention, some great conversation about what is happening at Walt Disney World. The Minnie Vans are hailed using the Lyft app, so you will need to have that installed on your phone. When opening the Lyft app on Walt Disney World property, you’ll see a Minnie Van service option. Many think the Minnie Van service is located in their DisneyExperience App, but you’ll have to download the Lyft app to take advantage of this service. Prices per service vary based on distance traveled from the pick-up location to requested destination within Walt Disney World property. You’ll see the total cost and pay for the service through the Lyft app. It tends to be a good bit more expensive than other ride-hailing services driven by private individuals. Once your driver completes your route and drops you off you will have the option to tip the driver within the app. There are accessible vans in the fleet and they were looking to expand to more. The accessible vans could accommodate an ECV, so it made it very convenient for guests using one. Because the buses are often long waits if there are multiple ECVs in line, the Minnie Vans offered a bit of control for guests so they knew they would be able to get their ride quickly. But with only a few in the fleet it can be difficult to get one when you need it. As Disney expands the fleet and their staff of trained drivers, you need to be prepared to wait on a Minnie Van. While the accessible vans are in high demand, so are the regular vans, especially at peak times. Most of the time Lyft timed out at least twice while waiting for a Minnie Van to accept our ride request, usually the third time was a charm. Just be prepared to wait and to use an alternative means of transportation if necessary. The Minnie Van can accommodate up to 6 guests, so it is perfect for families. Bonus for families is that there are also 2 car seats in each Minnie Van at all times. They are convertible so the driver can install them as rear facing, front facing or booster. One of our drivers explained to us that they each go through extensive training on the proper ways to install the car seats so they are safe—again, that peace of mind. The Minnie Vans can also accommodate a stroller in the back (if the car seats are moved out). The Minnie Van service is super convenient as it will take you point to point anywhere on property. The two best advantages for this are if you are going to the Magic Kingdom or Hoop Dee Doo Revue. At Magic Kingdom you get dropped off (or picked up) at the bus stop area, so you do not have to worry with the ferry or monorail. If you are going to Hoop Dee Doo Revue you are taken directly to Pioneer Hall—no internal bus transfers or multiple stops traveling to the Magic Kingdom. Saves so much time and headache. If you are traveling from one resort to another for a dining reservation the Minnie Vans make that so easy. Plus, you can have them drop you off exactly where you need to go. On one trip they were able to deliver us as close to our resort building as possible rather than dropping us off at the main lobby. Did you know that the Minnie Van will make 1 quick convenience stop for you during your point to point transfer? Imagine you had dinner at Epcot, but your toddler slept through it or wouldn’t eat from the menu. Our driver told us they will take you to the McDonald’s on property (by the All Star Resorts) for a quick run in for food. Or, if you need bottled water, snacks, or maybe some adult beverages and prefer to stop at the Speedway station on property to save some money . . . the Minnie Van will take you there. This is a great perk in the service to remember! 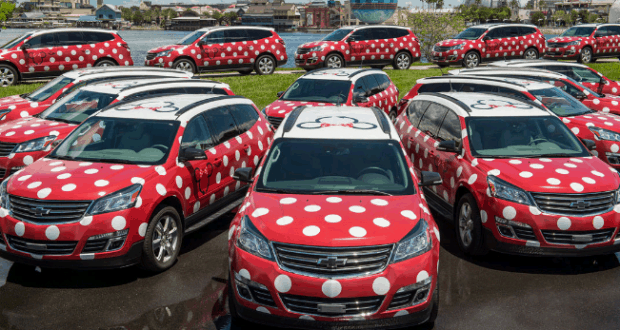 Have you taken a Minnie Van during your Walt Disney World Vacation? What did you think about the service?